Annie à la Mode: Fashion Friday: Death Before Decaf! 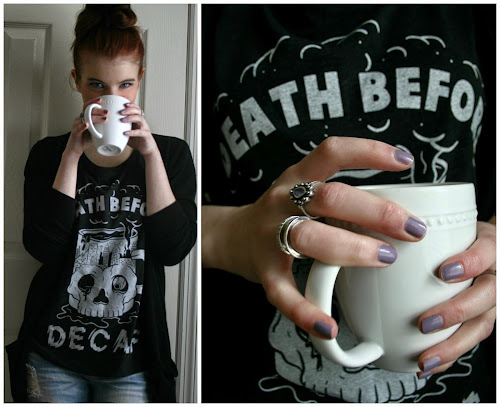 Fashion Friday: Death Before Decaf! It's been so cold, dark, and rainy here lately (hence the indoor pictures). I swear it's been at least a couple of weeks since I've seen the sun. With this type of weather I tend to retreat back to old favorites like oversized sweaters and comfortable jeans. I have been OBSESSED with this shirt Lewis got me for Christmas, it pretty much sums me up in one sentence, there's a time and place for decaf coffee - never and in the trash! Haha, Happy Friday everyone!